Do you wonder if you need supplements to support your low-carb diet? Low-carb diet authors and dietitians recommend supplementation, especially in the beginning. Lack of essential nutrients can derail your diet, no matter how hard you work. Getting all the required vitamins from low-carb food is possible, but requires meticulous planning. If you don’t have the time or the patience, a multivitamin is a cheap insurance policy against possible deficiencies. Low-carb lifestyle is still niche. Mass-market food companies create products for people on a “standard diet”. You know the one – recommended carb intake of around 300g a day, plenty of whole grains and fruit etc. Supplements market is no exception. Generic multivitamins usually include vitamins and minerals with 100% of the daily recommended values. These figures (“Nutrient Reference Values” in the UK, “Daily Values” in USA) are the official government recommendations on nutrition. But these guidelines assume the standard diet. So they are not that relevant to anyone who is on a low-carb diet. 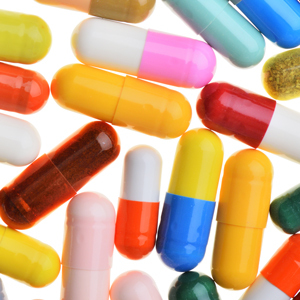 If generic multivitamins aren’t optimal, how can you find the right product? Let’s look at each point in detail. The last thing you want on a low-carb diet is a hit of pure sugar with your supplement. Unfortunately, generic multivitamin products are usually sugar-coated. Some include sugar-based fillers like dextrose or maltodextrin. Although the amount of sugar is small, carbs do add up. Don’t spend your limited carb allowance on supplement coating. So our number one requirement for a low-carb diet multivitamin – it must be sugar-free. Iron is an essential mineral. But too much iron can be harmful. Doctors advise caution when taking iron supplements. Meat and green leafy vegetables are excellent sources of iron. Both are staple foods for low-carb dieters, providing plenty of iron naturally. An additional iron supplement is unnecessary and possibly harmful. The only exception is vegetarian low-carb diets. I am not entirely sure how this is even possible but some people manage to pull it off. Vegetarians should supplement iron, as they don’t get any from meat. When choosing a multivitamin formula, look for an iron-free product. Whole grains and fruit are high in B and C vitamins, but also high in carbs. Some B-vitamins are present in red meat, but not all. B and C vitamins are essential for the normal functioning of almost all systems and organs in your body. Supplementing these vitamins has additional therapeutic benefits, for example, helping to reduce fatigue and increase energy-yielding metabolism. Many low-carb diet authors recommend supplementing B and C vitamins with extra-strong dosages. If you are on a ketogenic diet, with only 20-30g of carbs a day, you could go as high as 2000-3000% of NRV for B and C vitamins. You need to drink lots of water on a low-carb diet, to assist your kidneys. You will most likely feel extra-thirsty anyway. There is just one issue with drinking lots. It flushes out essential minerals and electrolytes from your system. Depleted electrolytes can result in muscle cramps and headaches. Your multivitamins should ideally contain a range of minerals. Sodium, potassium and magnesium are the key ones to replace. You can also get extra sodium by adding more table salt to your food. Specialised multivitamins may also include one or more extra ingredients, known to help with fat-burning metabolism and cravings. Although not a requirement, these nutrients can give your diet an extra boost. Chromium plays a role in regulating glucose, insulin and lipids. Studies indicate that it can reduce hunger and sugar cravings. For this reason, chromium picolinate is a popular supplement amongst dieters. Chromium is often included in multimineral formulas. To get the full benefits, get at least 200µg a day (500% of UK NRV). Carnitine is important for your body’s energy production. It transports long-chain fatty acids into the mitochondria to produce energy, concentrating in tissues that utilise fatty acids as a dietary fuel. Most people don’t need to supplement carnitine. 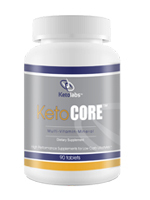 But if you are on a ketogenic diet, L-carnitine supplement can speed up ketosis and boost your fat-burning metabolism. According to Dr Atkins, Co-Enzyme Q10 works in collaboration with chromium and L-Carnitine to mobilise fat and reduce metabolic resistance. Some multivitamin formulas include CoQ10 in tablet form. However, oil-based CoQ10 supplements have better absorption properties. So it’s better to take CoQ10 as a separate oil-based supplement, or take it together with your omega oils. Green tea has a strong reputation as a diet aid. Research shows that it helps to control blood sugar, boost fat-burning metabolism, improve energy levels and reduce sugar cravings. It is also a strong antioxidant. Another popular group of diet supplements is spice extracts from the pepper family. Benefits may include improved digestive health, better fat metabolism and increased energy. They improve absorption rate of other nutrients, and so work well as part of a multi-nutrient supplement. Probiotics are healthy bacteria that live in your digestive system and help to keep it healthy. When you switch to a low-carb diet, probiotics may help your system to adjust while you get used to eating different types of food. Multivitamins help to protect your health while you diet. They can help you solve common diet problems, such as tiredness or sugar cravings, making your diet easier overall. But only if you do the work – sticking to your diet and doing exercise. Multivitamins are NOT magic pills to make you lose weight directly. Nothing works like that. Any product that claims otherwise is a fraud. At best, it would be a waste of money and at worst, might actually harm your health. In addition to your multivitamin, you might also want to consider omega oils, co-enzyme Q10 and fibre supplements. Read more about low-carb diet supplements. Although supplements can enhance your nutrient intake, they are not a substitute for a varied and balanced diet. On a low-carb diet, the best strategy is to use up your carb allowance on the most vitamin-rich foods. Don’t forget eggs, sour cream and cheese. Lemons are low in carbs but packed with vitamin C. Just squeeze a bit of lemon juice to your drinking water. Dietary supplements market is huge. With so many different benefits and health claims listed on each label, how do you know what to trust? There are some independent sources where you can double check information about supplements and their health benefits. EU Register of nutrition and health claims made on foods – European Union has stricter regulations than USA when it comes to health claims on supplements. European Food Safety Authority reviews related scientific studies and verifies all health claims used on supplements labels. You can use their online register to check if a claim is authorised. 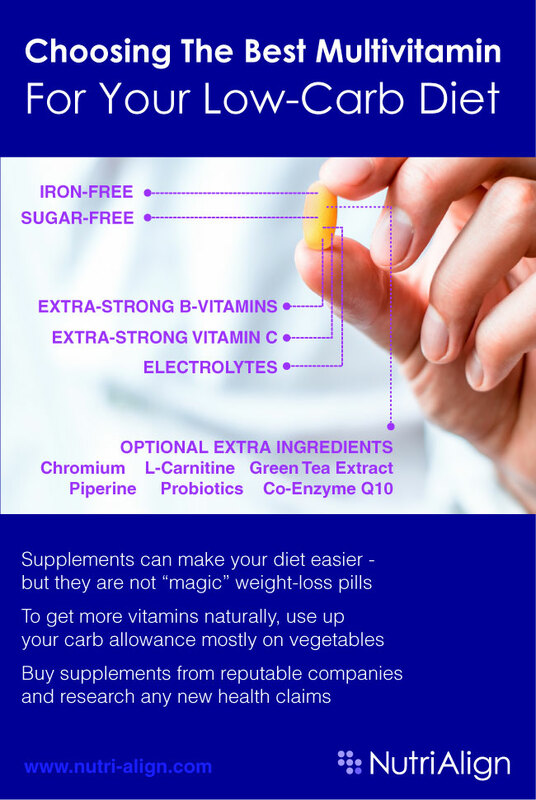 UK NHS – NHS provide a simple guide to vitamins on their website. When looking at their recommendations, bear in mind that they also assume “standard diet” rather than a low-carb diet. Low-carb diet is still niche, and the size of the market is small. Big supplement brands are either not interested, or don’t have the necessary expertise to design products for this small group of consumers. One massive supplements company (its brand name starts with “C” and ends with “M”) rolled out a low-carb multivitamin about 10 years ago – but it was sugar-coated! It flopped and got discontinued. Atkins Nutritionals used to produce their own supplements, according to Dr Atkins’ own formulations – such as Atkins Basic 3. Unfortunately, these have also been discontinued. In recent years, several smaller independent companies started to produce supplements designed exclusively for low-carb dieters. 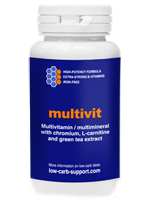 The following brands produce multivitamins and other supplements designed especially for low-carb dieters. UK-based manufacturer. Available in the UK, Europe, Hong Kong and the USA. Based in the USA. Delivery to USA. Great tips and list on what to take in terms of food and multivitamins for a low-carb diet. My doctor would be happy that I have come across this article as he has kept on telling me to diet urgently. Maltodextrine in a pill is such a small amount. It doesn’t have any effect on ketose. Hi April, all materials on this website relate specifically to low-carb diets, rather than low-calorie diets. Are you doing low-carb as well as cutting calories? Generally, you don’t need to do both.